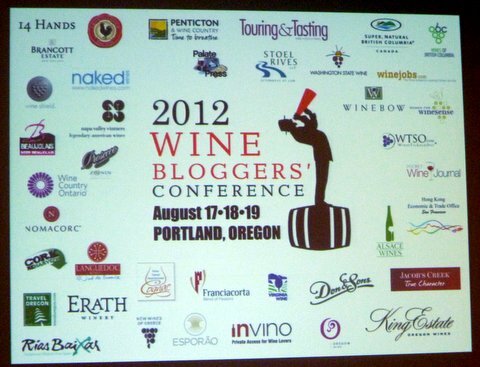 We are just back from the 2012 Wine Bloggers’ Conference, which was held this year in Portland, Oregon. It was a big event, with a sell-out 350 registered participants and about 40 more on the wait list hoping to get in. Randall Grahm gave one of the keynote addresses and Rex Pickett (author of Sideways and Vertical) gave the other. I was a moderator in a wine blogging workshop. It was great to meet so many wine bloggers and to get a personal sense of the vast virtual community of wine enthusiasts who read, write and comment on the web. The conventional wisdom is that the days of traditional media’s hegemony in the world of wine are numbered (if not already passed) and that younger wine enthusiasts will increasingly draw their influences from social media (blogs, Facebook, Twitter and so on) and not Robert Parker or Wine Spectator. The future of wine media might not be blogging, according to this viewpoint, but wine blogs are part of the evolutionary process. No one really knows if this is true or not, of course, and many wine bloggers secretly suspect that their readership is made up mainly of other wine bloggers. But the theory is just plausible enough to make wine blogging and a big conference like this difficult for the wine industry to ignore. So I was interested to see who would show up to try to develop relationships with the wine bloggers and how they’d go about it. The list of wine industry groups in Portland is quite long. Here, for example, is a list of the official sponsors. And then there were other industry groups, wine producers, public relations firms and individual Oregon wineries who had hospitality suites or organized pre- or post-conference events. Why did all these industry groups converge around the bloggers? Well, people might think that the wine business is about bottles and corks (and it is to be sure), but it is really about relationships and, more than that, it’s about story-telling. The wineries, wine businesses and regional wine groups were in Portland to tell their stories to the story-tellers and then hope that the message would spread. The fact that they would invest not insignificant resources to be at the conference says something about the importance of relationships and narratives in the wine business. There are lots of ways to tell a story and some were certainly more successful than others. The Oregon wine industry did an excellent job by embedding their wines firmly in the culture of the region, giving the bloggers a sense of the values that the wines are meant to represent. I’ve inserted above the short video that King Estate produced to be shown at the awards banquet, which they sponsored. It gives a good impression of the Oregon story generally as well as the particular philosophy of the King Estate family. Take this as an example of the high art of wine story telling (even though the wine itself plays only a cameo role in the video). You can only imagine how effective it was when the video, which introduced the faces, places and values, was followed by the actual food and wine and the real people who made them. It and the other messages that Oregon producers and the Oregon Wine Board scripted cannot but have left a strong impression on the attendees. Bravo. Winebow, an important wine importer and distributor, also showed great story telling skills. Winebow’s sessions showed off two faces of their import portfolio very effectively. The first program focused on the wines of Argentina (they import several brands including Bodega Catena Zapata and Bodegas Nieto Senetiner). Each wine was paired with a tasty bite and a story about the wine and food of the region. The variety of Argentinean wine was showcased along with the food and even the culture (we were treated to Tango dancers). The combination encouraged us to slow down and listen, think and talk about the wines and the country. If the story is that yes, Argentina is Malbec and steak (and this is a wonderful combination), but it is also much more, then I think it was told very well indeed. The second Winebow session was about “Off the Beaten Path” wines and it showed off the depth of Winebow’s portfolio. I think it was my favorite part of the conference. Sheri Sauter Morano MW led us in a tasting of seven wines that most of us had never tasted before and that many consumers would hesitate to try because of their unfamiliar names or place of origin. As I have written before, wine is ironically one of the least transparent everyday products and the uncertainty about what is in the bottle is a limiting factor in wine sales and wine enjoyment. Sheri focused on the story-telling aspect. She had us taste the wines “blind” and asked us to think about how we would describe them and tell their stories to readers. What reference points (in terms of more familiar wines or other qualities) could we use and how might we distinguish their signal qualities? The “reveal” provided additional information about each wine and challenged us: How could we tell the wines’ stories in a way that would resonate with readers and allow them to have the same interesting and enjoyable wine experience? I thought this was a brilliant approach and I hope some of the bloggers embrace it to introduce their readers to new wine varieties and regions. Wines of Chile is another skilled story-teller. I have worked with them on several projects and have always been impressed with their commitment to developing their brand message and their focus on social media strategies. They invited us to a participate in a pre-conference tasting that was a sort of moveable feast. About 20 of us boarded a double-decker London bus and visited three local venues (including an iconic Portland gourmet food truck cluster) where small plates of food were paired with particular Chilean wines. It was a very effective way to feature the wines and an opportunity to provide detailed and relevant information. Taking all of the events together, including pre- and post-conference events and the chaotic “live-blogging” tasting events, I think most New World and Old World wine regions were represented in one way or another. Who has missing? I’m not sure I saw any wines or literature from either Austria or South Africa but I admit they could have been there and I just missed them. And of course if would be impossible for all the different wine regions of France, Italy or Spain to be present, but the national industries were well represented by the groups that did attend. Bloggers need stories to tell and the wine industry needs story-tellers. No wonder everyone got on so well together at this conference. Thanks to all the sponsors who made the Wine Bloggers’ Conference possible. For more information I recommend Tom Wark’s assessment of the conference. I agree with Tom about most things, especially the value of real person-to-person face-time versus Facebook and Twitter. If you missed the 2012 Wine Bloggers’ Conference (like I did) and you are looking for more motivation to attend next year (none needed here). This is a great recap. Perhaps equally important is the embedded video from King Estates featuring the menu and suppliers for their featured dinner during the conference. The video expresses King Estate’s involvement in culinary endeavors and their strong commitment to local and sustainable ingredients. Cheers! Agreed! The Oregon and conference folks understand this, so there were several opportunities to visit individual wineries at the conference as well as great tours of the AVAs hosted by the wineries therein. We had a great visit to the Columbia Gorge AVA and met with four winemakers. Very useful. So the conference serves this function and then tries to go beyond it. How successful were the other parts? It depends upon who you ask. My post focused on the industry interest in event, which is appropriate for The Wine Economist. Great blogs on wine bloggers’ conference. It is superb ….